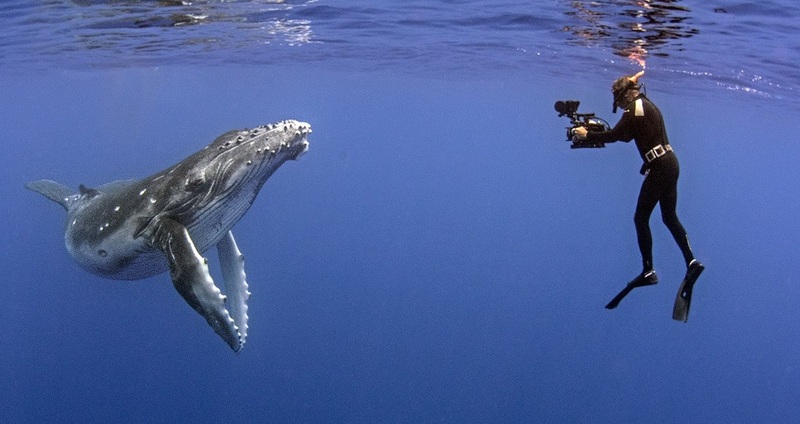 It’s not often that people can claim to have become an inadvertent internet sensation but for wildlife film maker Tom Mustill, this became reality when a giant humpback whale breached out of the water and landed on top of Tom and his friend in their kayak when they were out whale watching. Thankfully neither were hurt. The incident was filmed by a nearby tourist and went on to be picked up by news networks across the world, amassing millions of views. For most people this might be the end of the tale but for Tom, this kick started a hunt to go back to California and find the whale who’d done this and understand why. Importantly for Tom, he was clear from the start that he wanted this production to be made in the most sustainable way possible - as a wildlife filmmaker, he was only too aware of the environmental issues the world was facing and the negative impact a production could potentially have. The senior team were up front from the start when hiring crew and picking their post-production houses about their intentions to follow sustainable practices throughout the production process. Happily, they found their crew really receptive to the plan and everyone chipped in with ideas for ways to improve their working practices. When it came to hiring post production houses they were clear that they wanted to work with one that also took efforts to be as sustainable as possible such as by using renewable energy and having an environmental policy in place. They were pleased to find that again, the production houses were more than happy to comply and adapt some of their practices if necessary. Throughout the production, the team incorporated a number of sustainable practices to help reduce their footprint. Using lighter cameras and cases, working from home and calling in to meetings during the planning phase, having a strict ‘no plastic water bottle or take away food’ rule on location, hiring houses for their crew to stay in to avoid hotels, going paperless (and even pushing the BBC to change their policy on release forms! ), preparing vegetarian and vegan food and using local crew when possible. All these practices meant that from they managed to lower their carbon footprint from the prediction stage to actual. As a final step in their attempts to make their production as green as possible, Tom and the team took the decision to offset the carbon footprint of their production. They were aware of the criticism that surrounded this practice but found a company called Mossy Earth who shared their belief that offsetting was a logical step to take after you’d ‘done everything in your power to minimise your own carbon footprint’. Mossy Earth only work with like-minded businesses as opposed to giant corporations who offset for compliance purposes. Once they’d agreed on the company to offset with, the process was relatively easy. They knew the footprint of their production thanks to the albert calculator so it was simply a case of contacting Mossy Earth and working out the cost. For this production the offset cost was £300 which - in the grand schemes of a production budget - is relatively small. As Tom concludes ‘it doesn’t fix the problem but it does offer a solution on top of trying to reduce your footprint as much as possible’. For Tom, Cherry and the team at Gripping Films, they intend to take all their learnings from this project and apply it to their next film. ‘As we wrapped we sent an email to all our crew, asking what we could’ve done better to make this production even more sustainable and we had some fantastic feedback so we’re excited for our next production now. We hope we can go further’. Humpback Whales: A Detective Story is on BBC 2 on Friday 8 February at 9pm. The programme received a 3 star certification from albert.